I’m reading today how an 8 year-old boy was suspended from a Florida school for two years for getting caught with a toy gun in his backpack. The Zero Tolerance by this school’s administrators tells me that the child is better off anywhere else but at that school. Americans don’t have to surrender to or accept that kind of silliness from our tax dollar, sucking educators. They are free to find employment somewhere in the private sector. Guns are a part of world and American history. We have established a Constitutional right to keep and bear them. Toys and toys and children possess them. All toys should be equal in that a yo-yo or a doll is no different than a toy gun even at school. The children deserve their toys for fun during recess. 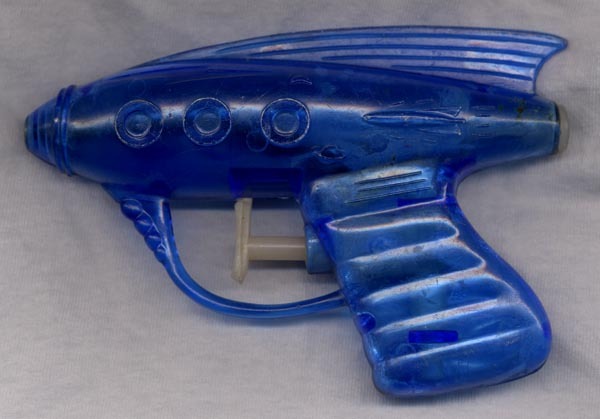 As a fifth grader I remember packing a water pistol to class for some serious combat during recess periods. I remember how on Boy Scout uniform day we all had out Boy Scout knives hanging from our belts. We all lived through those dangerous times somehow. At Senn High School in Chicago we drilled with genuine .30 Cal M-1 Garand rifles in our Junior ROTC class. We also had close up and personal exposure to the Browning automatic rifle and the .30 caliber carbine. Chicago’s public high schools with ROTC all had indoor 50 foot small bore rifle ranges. As a member of the ROTC rifle team, I had my own Springfield M-2 .22 caliber bolt action rife and commuted on two CTA buses with the rifle in a case with a box of ammunition in my pocket every week. I brought it to the ROTC room where Sgt. Ketzner would put it into the vault for me during the school day. At the end of classes I’d take the rifle home again on the CTA. Today that activity would be a national news story and I would be banished to some Gulag for life. When I was drafted a few years later my ROTC training was a huge help in facing basic training and the specter of deadly combat in Viet Nam. I served in Cold War Germany as a medical corpsman instead. We have allowed pathetic, frightened Socialists to run our schools. ROTC and its important training for national defense, has been expelled. Our country is weaker as a result. There is no evidence that the now decades old wave of anti-gun rights hysteria has made anyone safer in our schools. Can we please return to the days when men were men, women were women and we celebrated our freedom? We need to purge the intolerant, un-American, Socialists from our soil before they purge us. What a great picture! I used to buy those same squirt guns at our little neighborhood Ma and Pa store on the way to school on the far south side of Chicago back in the 70's. Great times. What has happened to the world during these past four decades? It's a damn shame. icktsesI attended Harrison High in the mid-60's. We even had a rod and gun club at the school, plus M-1 Garands during ROTC. And we were only a few blocks north of the County Jail!